When it comes to a pair of gloves, most of the time they happen to be extremely boring. Some of the gloves are used to provide protection, especially if you happen to be working with harsh chemicals that are not good for your skin in the long run, while at other times, gloves are used to keep your hands and fingers nice and warm even when it is freezing outside. Having said that, some gloves do come with more than their basic function, such as the Mi.Mu glove that makes music with your hand movements. Enter the $69.95 Light Casting Gloves, and as its name suggests, this pair of gloves will come with the coolness of having integrated lights. This advantage will be able to offer its wearer convenient, hands-free illumination. 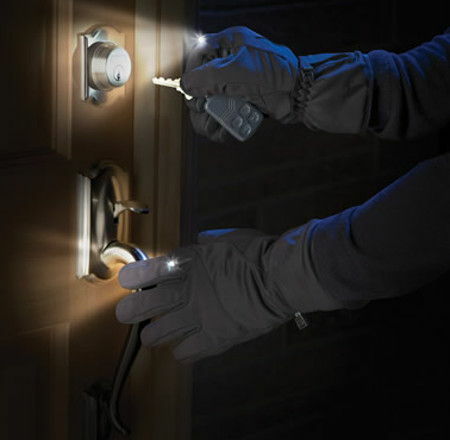 This is made possible thanks to LEDs that have been specially woven into each knuckle, and they do their job of illuminating through a simple press of a button on the wrist, resulting in a clear, bright light being cast onto a key hole or perhaps to help you rummage through the contents of your purse. Each of these fingertips come lined with a conductive material that will mimic human skin, resulting in the ability for you to still make use of your touchscreen devices even when you are wearing the pair of gloves. They sport a wind- and water-resistant outer shell, alongside polyester insulation to keep your hands warm, while the brushed tricot lining which is soft and smooth against hands would ensure you retain the beauty of your skin within.